Look! My New Book Got a Cover! When my first story was published in a children’s magazine, I knew that an illustrator would put a face on my set of characters. I was curious, of course, but hadn’t realized the importance of the illustrator’s personal interpretation of the writer’s story. I was amazed to see how someone I had never met had been able to see so many details just by reading my story. The illustrations did more than compliment the story: They were necessary to trigger a young reader’s interest and add depth to my words. I loved the combo of writing and visual art. The work of a book cover designer is different from a magazine illustrator. There are many elements to a novel. It’s impossible to depict all of them on a cover. 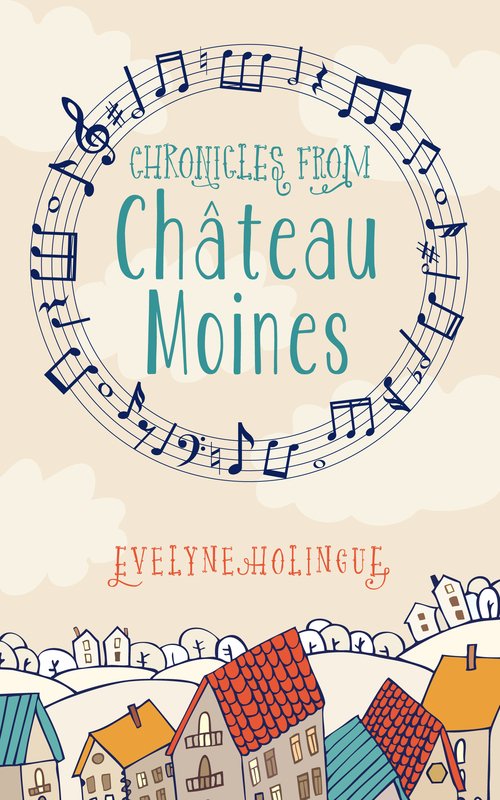 Based on the detailed synopsis and the author’s questionnaire that I provided to Jennifer, she came up with several design options for my middle grade novel Chronicles From Château Moines. September was a busy family month for me, and not the easiest way to work, but thanks to our fabulous technology tools, I was able to follow Jennifer through her creative process and progress while helping my son moved into college, visiting my daughters, and seeing friends all over California. Jennifer and I were working and living on Eastern and Pacific Times but we did it! Stay tuned for more news coming up soon! That looks wonderful. Thanks for sharing sone of the behind-the-scenes effort that goes into publication. It’s fascinating to perk into the various crafts involved. Good luck with the book! Thank you, Dan. It was a good journey to put this book together and I’m excited to hold the first copy in my hands sometime next week. Then if everything goes well the book will be available very soon after. Thank you for your support. Oh i love this cover. It’s just perfect. Congrats on finding just the right thing, Evelyne. Hugs! Thank you, Teagan. I’m happy to see your enthusiasm and hope that others will feel the same way. Hugs to you too! This cover would definitely attract my attention. It projects a sense of fun and whimsy. The font is attractive and easy to read. Thank you so much, Nicki for your support. I’m glad that you find the cover attractive. We live in a very visual world and Jennifer came up with lots of good ideas that I wouldn’t have found myself. The font was one of my major focus since it has to be easy to read, you’re right. Because Sylvie, one of the main characters, is writing songs in her notebook Jennifer thought that this type of font would work well. See you soon on your blog. Evelyne, how exciting! The cover is wonderful and I could relate to your description of the many choices and decisions involved in arriving at the finished product you desire. I’m eagerly awaiting the next update! Of all people you know how it feels to walk, step by step, to the final line. I will get a first printed copy next week and cannot wait to see the product. Hopefully it won’t need any changes and we can go to print. How is your new book doing? See you soon. I love the cover – it is perfect for this fine book. I especially like the musical circle that wraps around the title. Thanks for sharing – I can hardly wait to see the book in its entirety! Thank you, Claire. I am also happy with the cover design and impatient to hold a printed copy. See you soon. Oh ! très belle couverture, j’aime bien ce graphisme et la calligraphie choisie, et je me dis : qu’y a-t-il dans ce livre? …Que j’aimerais bien lire ! Merci! Je suis certaine que ton niveau d’anglais est suffisant pour te jeter à l’eau quand le livre sera disponible. Merci en tous cas pour ton constant support. I love your cover. Wonderful choice. Can’t wait to read it. Thank you, Elizabeth. The theme and plot would probably match one if your children’s age and reading level. I appreciate your support. BEAUTIFUL cover, Claire! I love everything about it – from the colors, to the village design all the way to the very cool title font/graphic. Congratulations to you and Jennifer for a stunning cover design. Thank you, Kimberly. I am looking forward to having the book printed and available to young readers (and older too) very soon. See you on your blog. I love it! It is both elegant and playful. Excellent!! Thank you, Marilyn. The book designer had a good eye and was patient with my countless questions. See you! The cover is charming. How fortunate to have clicked so well with the illustrator. Looking forward to hearing more about your publication process. Thank you, Nance, for stopping by. I was lucky to have introduced to Jennifer through a blogger I like to read and who reads my blog too. So I already knew that she could be a good choice. Her artistic eye was great and we got along well through the whole process. I will keep everyone posted on the next steps through my blog. See you soon. Congrats! I know so many authors who complain that their characters and cover didn’t turn out the way they wanted. Great for you that this wasn’t the case! Thank you for stopping by. I’ve heard the same comments. Honestly, I had some ideas but I’m not a book cover designer. As soon as I saw the options Jennifer sent me I was surprised and admirative that she could come up with ideas so different and so much better than mine. I strongly believe that a cover is an important part of a book. Everyone has skills and we should rely on an illustrator or book cover designer when we want to go indie with our books. Jennifer and I worked well together because she was listening to what I had to tell about the story and I trusted her artistic eye. I feel lucky for that. Hope to see you again soon. Congrats to you again! Same here. So nice to read your supportive words, Sherri. I’m glad that the book cover makes you want to know more. Your kids are too old now but maybe you know younger readers who might like this story. September was certainly a busy month for me. But busy can be great too. I’m glad that I was able to mix family business, business business and writing projects. You’re right: It is possible, thanks to our modern tools. See you very soon on your blog for new life adventures. You are too kind, Melanie. Merci beaucoup. Ce roman est en anglais mais peut convenir aux jeunes lecteurs qui apprennent cette langue. A plus sur ton blog. Fantastic and congratulations, the book cover captivates – love the animation. All coming together perfectly and just in time for the holiday rush. Coming from a talented artist, I am happy to read your words, Mary. The book cover designer was fun to work with because she kept sending me ideas. I liked so many that it was hard to pick. You’re right about the publication time. This book, hopefully, will be chosen for a holiday gift! See you soon on your beautiful blog. Great choice. It suits the story very well! Thank you so much, Stella. I hope many readers will love the cover too! Good luck to your book too. See you. I absolutely love the cover! I think the vivid colors and the cute pictures will draw the reader in. Thank you, Jennifer. I agree that the cover is lovely and triggers immediate attraction. I’m glad that Jennifer insisted for a few things that she was able to see while I wasn’t. I was talking with a group of middle school students yesterday and had a proof copy with me. They all liked the cover. So I hope lots of people will as well! See you soon. How exciting it must be Evelyne to go through the process of choosing and then to have something that you’re happy with. Congratulations, it’s a very appealing cover. Thank you, Andrea. It was a great journey from writing the very first draft of this story to revising until the last version, and then going through the formatting and cover design. I am happy with the finished product ,and Jennifer played a major role since I also like the cover very much. See you soon on your beautiful blog. I say YAY! It looks just wonderful! Thank you, Linda. I appreciate your support and enthusiasm a lot. Wow, your graphic book cover designer did a terrific job. I just loved the colors, circle of music and how it reflects elements of the story. Love Jennifer’s site too, thanks for including it in your post. Thank you, Mona. I agree that Jennifer did a beautiful job with the cover. It wasn’t easy since I was away from the comfort of a home as we worked on it. And she pulled every detail together until it was as good as we both wished it could be. Also there are many elements to the story and it was hard to pick the most significant. The final product is really lovely. Glad for Jennifer that you checked her website. See you soon, Mona. Love this. Lately I’ve had the privilege of seeing the artist’s sketches for the cover of a novel I just edited. I love what she’s doing and can’t wait to see the final version. It’s making me think very, very seriously about hiring her to do the cover for my novel in progress. Novel in progress has a strong visual angle. The protagonist is a visual artist, but I’m not — and it would be wonderful to see how a real artist interprets what I see in my head and describe in words. Thank you, Susanna. Really, it’s a great, great idea to work with a cover designer for a book. If your book is about a visual artist, then you need a cover that illustrates this important aspect. Jennifer who did the cover design of my new novel came up with many options and I was often surprised to see the way she understood my story. In the end, she was right about everything she suggested. Good luck to you with the writing of your novel. Let me know how it goes.